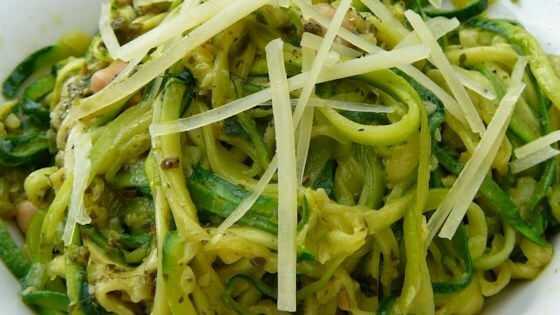 "Transform zucchini into long strands that resemble noodles, also known as zoodles. Mix pesto and garbanzo beans into the zoodles for a satisfying, grain-free meal!" Heat olive oil in a skillet over medium heat; cook and stir zucchini until tender and liquid has evaporated, 5 to 10 minutes. Stir garbanzo beans and pesto into zucchini; lower heat to medium-low. Cook and stir until garbanzo beans are warm and zucchini is evenly coated, about 5 minutes; season with salt and pepper. Transfer zucchini mixture to serving bowls and top with white Cheddar cheese. Zucchini & shrimp get fresh together! Use any sort of spiralizing device to make the zucchini into noodle-shape. I used the Paderno® World Cuisine spiralizer. i left out everything but pesto, zoodles and Parmesan cheese to reduce amount of calories. so good! i would take these over regular pasta any day!